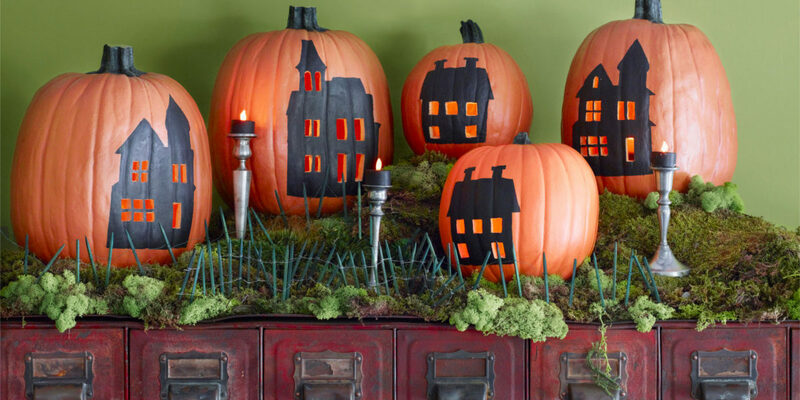 Nothing can cozy up a halloween gathering than a well decorated home. Since the theme is halloween we decided to list out ways of decorating your fireplace and home with the help of a pumpkin. After all nothing defines halloween like a pumpkin. This is a great and an awesome DIY activity for you. 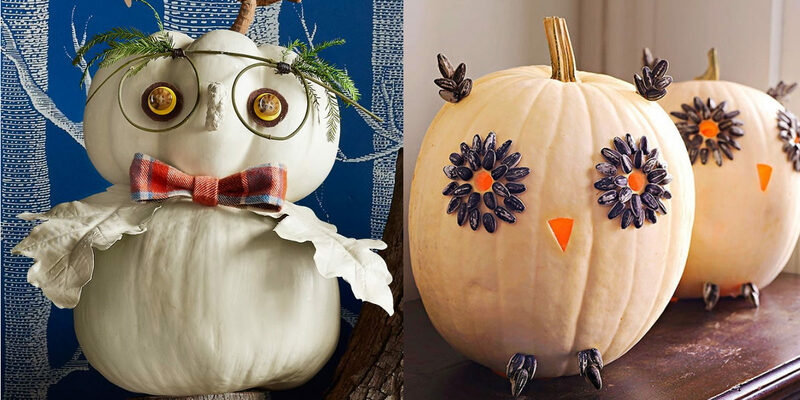 You need two white pumpkin and few accessories to create a cute owl out of it. Hot glue two white pumpkins and cut out the eyes. You can also glue gun brown and black buttons on the pumpkin for eyes. Create the spectacle frame with the help of think twigs and accessories the remaining with bow ties and leaves. This can be a great decor for your fireplace, entrance or even your kids bedroom. This is probably the easiest DIY in the list and therefore something that you must try. Cut the pumpkin from the bottom and scoop out the seeds and pulp from the inside. Draw a rough outline of any design of your choice on the pumpkin. Drill out hole on the design outline, like in the picture given above. Light a bulb near your fireplace and place the drilled pumpkin over it. The effect will lighten up the whole ambiance. If you are fairly okay at hand stitching, this DIY is going to be quite easy for you. Again you need to cut the pumpkin from the bottom and scoop out the pulp and the seeds. Using a pencil draw any design of your choice with a series of Xs. 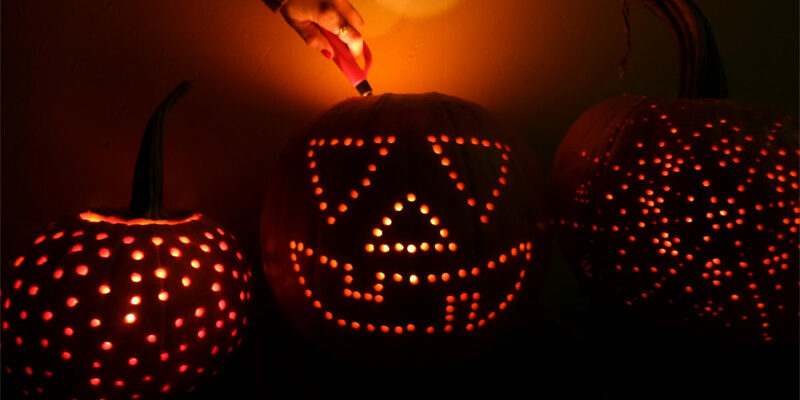 Use a drill and hole the corners of every X on the pumpkin. Use a large needle and a string and create a cross stich along the Xs. 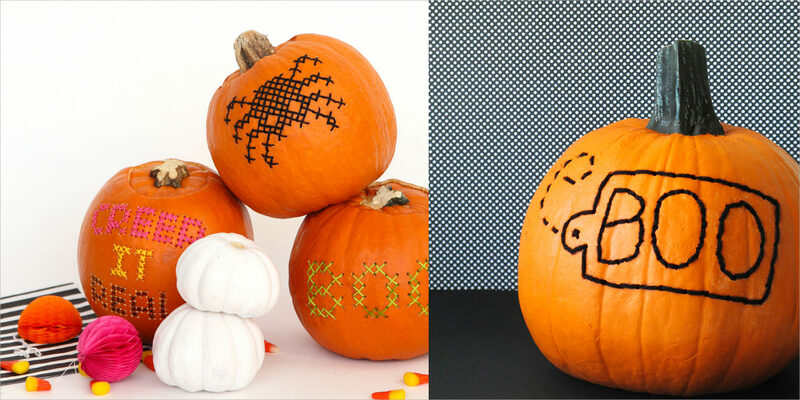 Your embroidered pumpkin is ready to warm up your home. Another super easy and fun DIY for you. You will need a chalkboard spray paint for this activity. Once you have it all you need, spray the paint on your pumpkins and wait for it to dry. 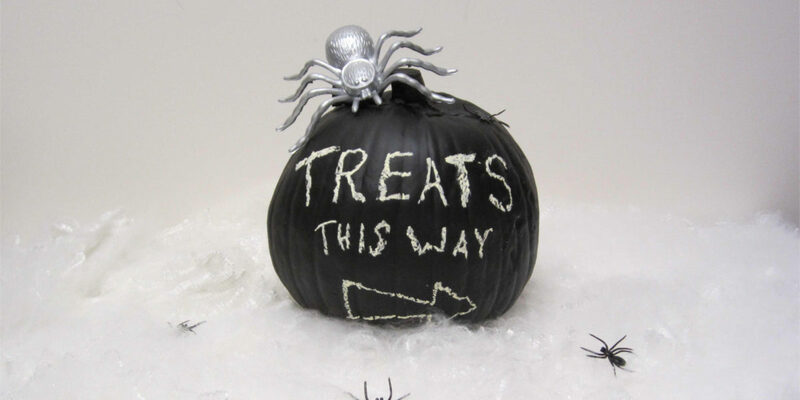 Once it is dried use a chalk and scribble down your message or draw any Halloween related illustration. Choice is completely yours! This will certainly give a unique look to your fireplace and your garden. This DIY demands a little bit of effort. You will have to indulge in both carving and painting. But it is going to be fun. Start by scooping out the pulp and seeds from the pumpkin. Then draw a castle on the pumpkin and color it black. Cut out the windows from the castle buy carving the pumpkin. Keep it near your fireplace or window panes over a light bulb and watch the castle illuminate. This looks difficult but is very easy once you start doing it. You need a white Pumkin, few yarns and medium size branches, buttons and hot glue gun. Tie colorful yarn around the branches and use them as antlers for deer. Make eyes from buttons and stick them with hot glue gun. Taken small piece of any warm cloth and use it to create the ears. 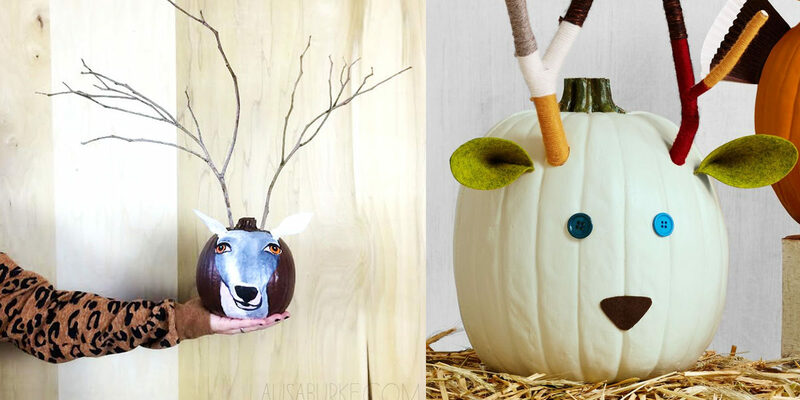 You have a deer pumpkin ready that you can save till christmas. 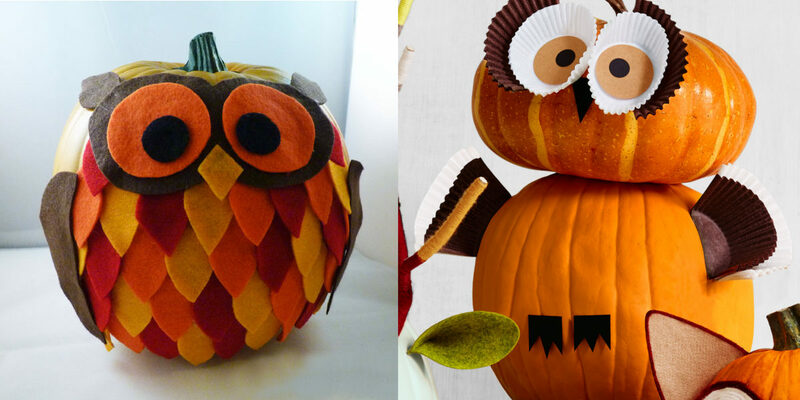 For this owl pumpkin you will need cupcake wrappers. Glue two pumpkins over each other with the help of hot glue gun. Use the cupcake wrappers as shown in the picture to create the eyes and hands. Use similar color papers to cut out the eyeballs and stick them in the cupcake wrapper to complete the eyes. The kids are going to love it and will not leave your fireplace area. Scoop out the pulp and seeds from the top of the pumpkin. Put a candle inside the empty area and make sure it fits the area . 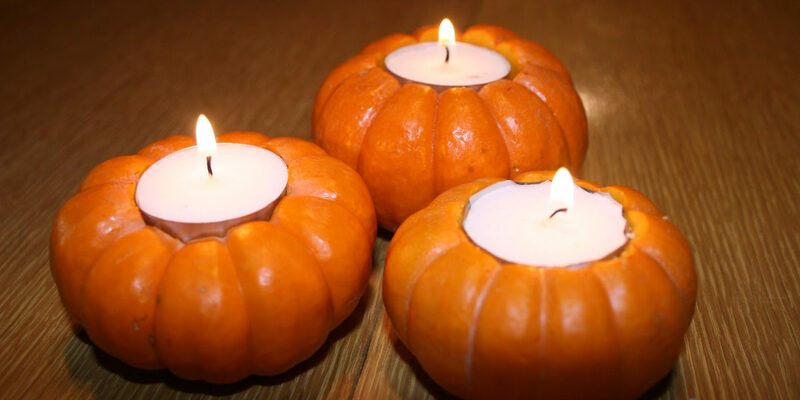 Create as many as you can to brighten up your fireplace, entrance and living room with these pumpkin candles.